Ten years ago when I moved to this house the patch of outside space was mostly overgrown. There was a small patch of annual weeds surrounded by mountains of brambles punctuated with ‘vertical interest’ provided by the odd self seeded holly or sycamore sapling. I spent my first summer working my way round the plot clearing, clearing, clearing. I have read in gardening books that you should leave your garden for the first year allowing any glorious unexpected plants time to be discovered. Well, that would have been a waste of year for me as apart from a fully grown, 40 year old philadelphus, I discovered a stunted apple tree supporting an ant colony and a pale pink peony in deep shade!! 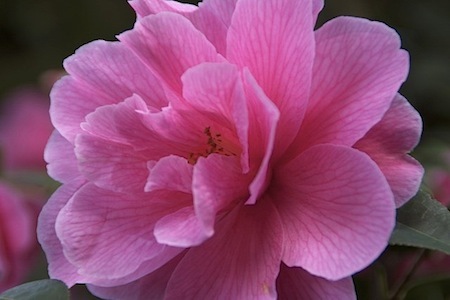 And, then there was this camellia, colour of flowers unknown, and no sign of flowering. 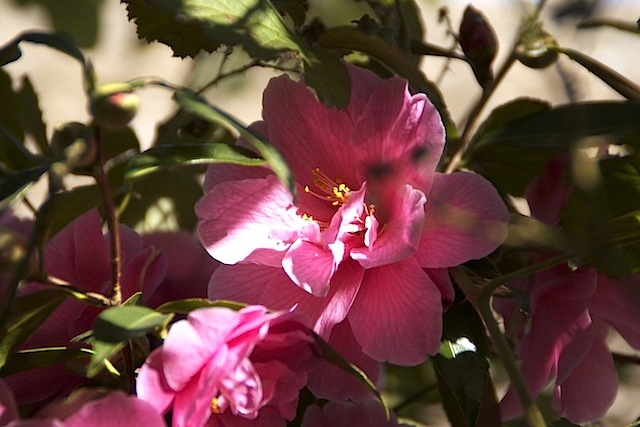 As I have mentioned before I garden in a region with low rainfall on very free draining soil, altogether not suitable for camellias, but here was a camellia. Yes, it was sickly and struggling, but surviving – so I moved it to light dappled shade, fed it and drenched it with rainwater in dry periods and 10 years later it’s getting into its stride. Gardening is a game of waiting.